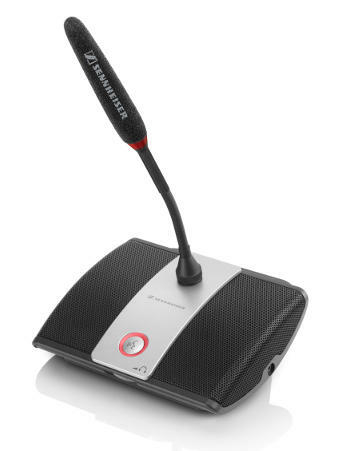 At ISE 2014, Amsterdam, and at InfoComm 2014, Las Vegas, Sennheiser launched two conference systems. In addition to TeamConnect, a complete solution for hassle-free telephone conferences, Sennheiser also unveiled ADN-W, the wireless extension of the acknowledged ADN conference system. “ADN-W expands our successful ADN conference system by adding the freedom and flexibility of a wireless solution," explained Jens Werner, Portfolio Manager Integrated Systems Division at Sennheiser. "ADN-W also offers the same reliable and trouble-free operation due to the large wireless spectrum linked with automatic, dynamic frequency management." The ADN-W (Audio Distribution Network Wireless) digital conference system uses both the 2.4 GHz and the 5 GHz frequency range for reliable operation. ADN-W is a hybrid solution that enables wired components to be combined with wireless ones without problems. This means that existing ADN systems can easily be expanded by adding ADN-W components, and all discussion units can then be directly controlled from the same central unit. The replaceable rechargeable batteries guarantee an operating period of at least 20 hours for the ADN-W discussion units. "ADN-W also provides optimum speech clarity," said Jens Werner. "The icing on the cake is the legendary ME 36 super-cardioid. This shotgun microphone, which is made in Germany, is now available as a gooseneck solution exclusively for ADN-W and guarantees a level of audio quality that is unsurpassed on the market." In order to exclude all unwanted listeners, audio transmission via the Sennheiser ADN-W conference system is encrypted: AES 128-bit encryption protects the system securely against eavesdropping. The flexible ADN-W Case contains dedicated, stackable modules for all system components, as well as integrated units for re-charging the discussion units. The sturdy charging and transport case can be individually adapted to the size of the system. Furthermore, Sennheiser provides regular software updates to continuously improve the ADN-W system and to ensure that it maintains its state-of-the-art technology.